Audi has developed what could become the fuel of the future. It is made from CO2 (carbon dioxide) and water. The resulting fuel is called e-diesel. The German Federal Minister of Education and Research Prof. Dr. Johanna Wanka put the first five liters into her car, which happens to be an Audi A8 3.0 TDI clean diesel quattro. “This synthetic diesel, made using CO2, is a huge success for our sustainability research. If we can make widespread use of CO2 as a raw material, we will make a crucial contribution to climate protection and the efficient use of resources, and put the fundamentals of the “green economy” in place,” stated Wanka. In a demonstration of just how green this new fuel is, the plant operates on the power‑to‑liquid (PtL) principle and uses green power to produce a liquid fuel. The CO2 used is currently supplied by a biogas facility. 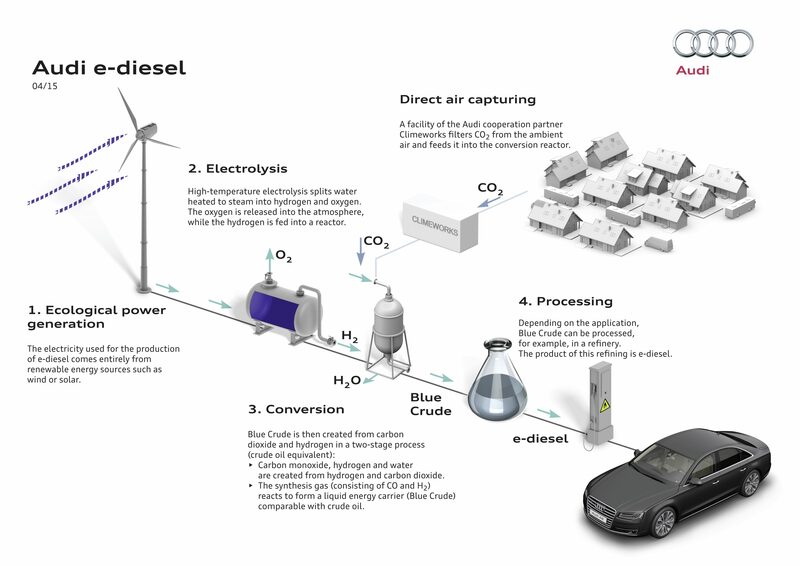 Also, a portion of the CO2 needed is extracted from the ambient air by means of direct air capturing, a technology of Audi’s Zurich‑based partner Climeworks. How does water and CO2 become fuel? Water is heated to form steam, which is then broken down into hydrogen and oxygen by means of high-temperature electrolysis. Then the oxygen is released into the atmosphere and the hydrogen is sent to a reactor. Once there it reacts with the CO2 under pressure and high temperature. The result of this reaction is water, carbon monoxide and hydrogen. The final reaction causes the gases to combine to form a liquid made of long-chain hydrocarbon compounds, known as blue crude. This product is similar to fossil crude oil in that it can be refined to produce fuel. The best part is this fuel will be free of sulfur and aromatic hydrocarbons and it has a high cetane number meaning it is easily ignitable. Audi has tested this fuel and found it could be used on its own or even mixed with fossil fuel. The entire process appears to be ecofriendly, or at least as ecofriendly as it can be. The overall efficiency of the process, from using renewable energy, wind and solar, to power the plant, to the actual synthetic e-diesel is around 70%. The plant is set to produce over 3,000 liters (792.5 US gal) of Audi e‑diesel over the coming months.